An expression of our connection to God and our connection to Nature and Natural Phenomena. It may surprise — and even anger — many European Americans to find that African Americans have never liked the modernist’s preoccupation with glass houses and such. Even today I find myself repulsed by magazine ads showing expensive and opulent bathrooms in high rises with an exterior glass wall that look out over an urban landscape so that you can enjoy the view with your morning constitutional. There is no privacy there. The modesty of the situation is questionable as it depends on reflectivity, daylight and interior lighting all being just so. This is the difference in the African American experience. Since there were slave huts in the Southern US and teaching slaves to read was deemed illegal, African Americans have not wanted other folks to know what was happening in their homes. The physical violence of the post civil war period up through the civil rights era in the 60s also reinforced this. African Americans often did not want the neighbors to know if they were home or not. They did not want a posse to ride by with their shot guns and bombs and find a worthy target in a visible black family. It was probably not that they felt safer i hiding. It was likely that they felt less unsafe. Safety, to a greater extent, was a myth. The 1930s and 1940s, through to the civil rights era saw the development of a substantial black middle class. This group had a second concern. Though they might only be postal workers, factory workers, trash collectors or bus drivers they were the emerging middle class and had a bit more than their impoverished neighbors. It seemed to many that being the first one on the block with a television set or color television set or microwave was not something to be celebrated. It was to be hidden so that envy was not created and the valued symbol of affluence was not removed by the jealous desires of a criminal element. Such losses did occur. I remember them well from my childhood. I still see it among African Americans today.It is not exclusively African American. In Detroit property crimes even in the suburbs track a close relationship to the areas level of economic hardship. Yet African Americans are not particularly enamored of living in dark places. Yes, we are as capable of activities by candle or lamp light as any other people on the planet. We prefer daylight. But more than we prefer daylight we prefer to control our privacy. So bringing natural light in from above is a natural solution to these divergent values. No, don’t mistake this for a love of skylights. African Americans do not want people looking in on them from above either. Thus in an African American Architecture the use of clerestories or translucent surfaces below skylights or lanterns would encompass a range of solutions that can bring in varying amounts of light, vent heat, allow for the perception of the time of day (Broadly) and the weather. It might be most accurate to say that African Americans prefer natural light without placing themselves in view. We have been discussing an architecture of meaning. Yet light has here only been described in practical terms. But light does have meaning. While there are some who would deny this, the African American experience includes a deep spirituality. This spirituality is expressed in both the Christian and Moslem faiths. Both traditions endeavor to use architecture to become closer to God. I will not dwell on the detailed and deep architectural traditions of these faiths except to say that they share a desire to create quiet meditative places as well as ones where a dignified but joyous celebration of the community may be held. Let there be no competition as to which faith has the more joyous wedding or the more solemn funeral. The depth of grief and the heights of joy can be shared and understood by all people. Thus the light from above, this indirect filling of a room with a perceptible presence of an intangible spirit, expresses this desire for a connection to God, Whether the proportions of the room are high or low this qualitative sense of tangible peace is an important piece of what is sometimes missing in European based architectural traditions. Family is important in African American traditions. The place of the elders and respect for them is common. And the elders are remembered even as they pass into the afterlife. And while other cultures also respect their elders for their wisdom, strength and ingenuity, in the African American and some African traditions the spirits of the elders are invoked for assistance with temporal problems right now. Thus this implication of spirit implied by light from above is also a conversation with the spirit of the elders. Their spirits are no more or less tangible than the spirit of God. Many African Americans subscribe to the idea that the spirits of the elders are joined to the spirit of God. Not unlike the Catholic saints, they intercede for the penitent with a more powerful good to sustain the distressed here and now whatever their distress might be. Light from above is not the exclusive way to model this connection to God. Let’s look at it more in the section for Quiet spaces. Expression of structural strength as an expression of our perseverance, endurance and strength. Expressed structure is not an uncommon feature in Architecture from gothic to Modern. Part of that is the necessity of structure. Yet every new technology enables new structural concepts and possibilities. The Crystal Palace was the age of enlightenments celebration of cast iron structure. Many buildings in the modern movement, especially Wright’s Guggenheim and Corbusier’s chapel at Ronchamp, celebrated the possibilities of concrete. We enter an age of new technologies too numerous for me to want to list out and which can be combined in ways that stagger the imagination. There may be in our future 3D printed structural members in steel or 30,000 PSI concrete combined with fabric roofs and massive cross laminated timber walls and floors. So this is our opportunity to recreate structure as an expression of culture and perspective. Structural columns might express not only the aspiration of rising up but the struggle to do so. Gradual shifts in structural sizes and techniques in a non linear recursive fashion might indicate the wave like nature of our perseverance as a people: rising and then falling only to rise again. The coarse nature of the structure might, over the circumference of a building, evolve into a smooth expression of refinement thus denoting the changes in the development of African American cultural and financial success. That gradual refinement need not be a representation or adoption of a European standard of beauty. Rather it might be a depiction of the cost of the journey to modern American society. It may show not so much how African Americans have adopted European values as how the forces of society have worn down and stripped away the Africanness from our identity leaving us as a different people with a different perspective from the many different peoples of Africa. The change in structure may depict the formation of a new tribe or a new way to envision tribalism. What if tribalism was a fluid phenomena? Yet, structure can also reveal the innermost core and sustaining values of a building or people. Erosion of structural coverings might model the removal of imposed European American values and reveal the core Africanness of our people. Or it might reveal our core humanity beyond geographic thought frameworks. It is not necessary to think of structure in terms of pyramids and rounded painted mud brick buildings to suggest that the origin is in Africa. Rather the structure of African American Society has always been in the people. Shacks, modest homes, fine houses of worship, businesses and other places we treasured were torn away. Some were removed by redlining, others by interstate highway construction.We learned to adapt. So perhaps adaptable structures might express this resilience. Structures that move and sway or turn and bend without causing discomfort. 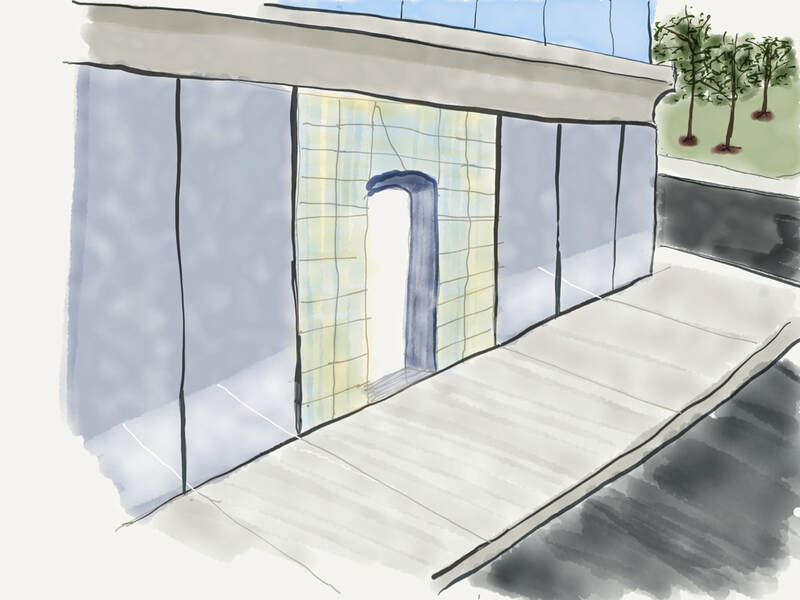 In the Image below a modern urban building is envisioned with a near mirror finished stainless steel base allowing a textured reflection of the passerby. That coarse reflection is in contrast to the glass of the upper stories reflecting a clear image of the sky. The entry is through a thin steel arch that supports glass block. the entry wall is itself textured glass and back lit. That backlighting might be by piped daylight during the day and by LED arrays at night. The translucency promises not the defensive space implied by the metal but an inner openness where the visitor is promised enlightenment for their trouble to look within by entering. Our resilience as African Americans is formed by our network of community. For most this begins with family. Other with a community of choice. So one expression of that might be a network of small structural members that together hold great loads and is resilient to severe weather challenges. Baskets, a cultural tradition that includes African tribes as well as many other places, are a small example of such structures. Simple weak grasses woven into a structure which can carry loads that might challenge a person’s ability to lift them. Expressed as a building there is no need for a building to look like a basket turned upside down. It might be that large panels of spaced woven metal strips provide a supportive framework to shape and support a translucent fabric skin that is both light fixture and expression. It might be that a 3D printed concrete floor panel component might take that basket texture and softness and use it to provide a stiff but thin floor that uses less material. In Architecture without meaning the structure simply reflects the practical necessities of supporting floors, wall and roofs. In architecture with meaning all these mundane tasks are re-examined from a metaphysical or metaphorical perspective. Why should any part of a building be without meaning? The question rather is What does it mean and can the various levels of meaning be communicated without lengthy and wordy explanation. As we move to a truly African American Architecture these things will be investigated. Not every project will reach its zenith. Many perhaps will fall short. We shall all be more nourished for the failures that will show a touch of spiritual presence and consideration. It is our humanity that the structure expresses. The bones of our society on which we shall hang not only our sufferings and trials but our dreams and aspirations.